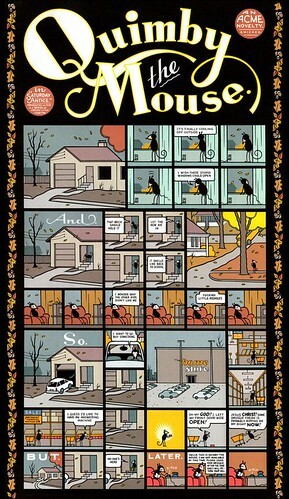 Cloistered away in his Chicago studio, Chris Ware spends hours meticulously lettering covers, splash panels and dialogue boxes. Simple conjunctions such as ‘and’, ‘thus’, ‘later’ and ‘meanwhile’ are imbued with the import reserved for more expressive bon mots. 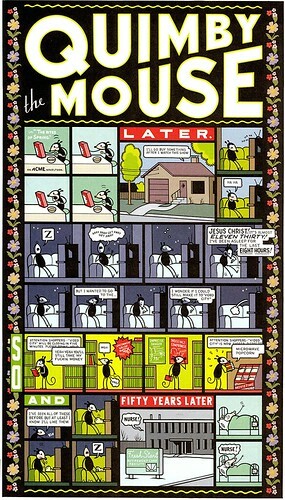 Ware, the man behind such contemporary illuminated manuscripts as Jimmy Corrigan: The Smartest Kid On Earth, Rocket Sam, Big Tex and Rusty Brown comic strips, as well as the ACME Novelty Library comic books, is a compulsive letterer. 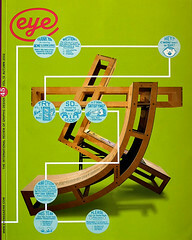 Over the past decade, Ware has refined a unique illustrative and typographic language that bridges comic art and graphic design. 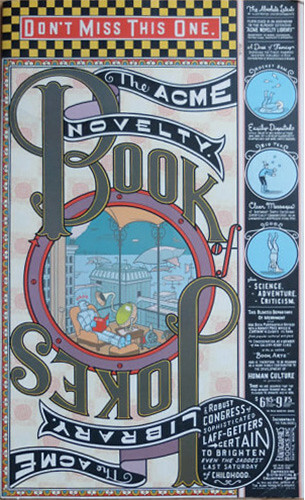 The lettering for the cover from The Acme Novelty Book of Jokes (no. 7, Summer 1996) is lettered precisely in the old show-card tradition. 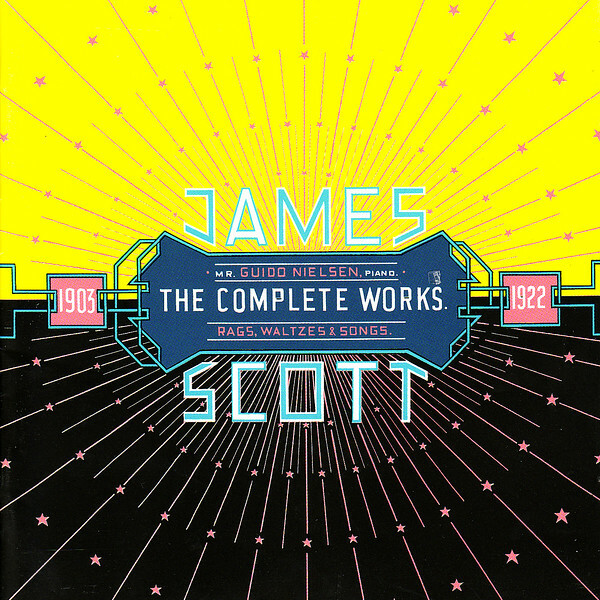 Top: Cover for James Scott: The Complete Works, 2001. For Ware, the act of rendering the notes almost exclusively by hand was a labour of love and a way of expressing his admiration for arcane ragtime. During the 1990s, when a surfeit of stylishly distressed and often foolishly stylish digital fonts were routinely issued, Ware crafted some of the most artful alphabets and colourful letterforms seen in print, most of them for his own comic books, but occasionally for less obvious venues, too. One of these was the 2001 ‘Summer Reading’ special issue of The New York Times Book Review (under my art direction) for which he redesigned the otherwise immutable masthead, rejecting all traces of the standard Bookman typeface to conform to the visual character of the comic strip that began on the cover and continued inside, all rendered by hand. The only residue on the cover of official ‘Times Style’ was the Old English Times logo anchored to the masthead. Ware replaced the contemporary one with a much older version. This was not, however, arrogance or hubris on his part. Ware is one of the most sincerely unassuming artists I have ever known. So devoted is he to the most arcane details of vintage commercial art that he actually knew that the earlier Old English version (long obsolete) had an iota more calligraphic flourish than the newer, ever-so-slightly streamlined version. Yet more importantly, he put in the extra effort (which is considerable when one is on a tight deadline) to render these intricate letters by hand. And that’s not all. Throughout the interior of the Book Review, Ware used an original, quirkily curvilinear abstract display lettering style that transformed the publication from its usual literary look into a typographic carnival that transported the unaware readers some-WARE else. 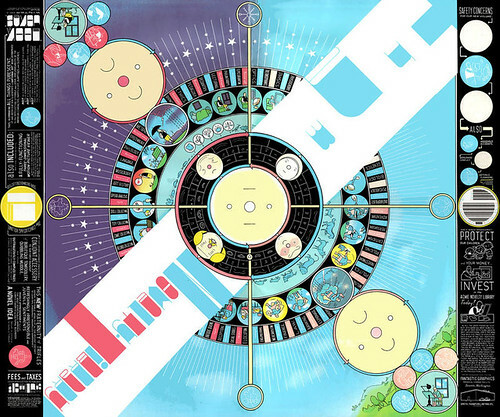 Ware’s comics are so conceptually astute and compositionally engaging that they cannot fail but connect with their audience. His sympathetically melancholy characters (Jimmy, Rusty, Quimby the Mouse, among them), his nostalgically futuristic world-scapes, and his genius for conveying subtle time-shifts in two-dimensional space have all the components of compelling narrative. But it does not take a design critic to realise that his ingenious typography is equally (perhaps more) essential for enabling access to an eccentric comic world that could otherwise be opaque. Ware’s various lettering and typographic compositions exude a curiously universal allure and a timely timelessness like that of a personal signature. Yet one will be hard-pressed to find any of his custom (and nameless) faces in digital type foundry specimen books. All the letters in this cover from The Acme Novelty Library (no. 15, Winter 2001) were rendered by hand. In addition to his instincts, however, Ware is inspired by Victorian, Art Nouveau, and a multitude of nineteenth- and early twentieth-century commercial display styles, particularly from old sheet music, magazines, advertisements, record labels and fruit and cigar labels. ‘I steal constantly from all sorts of things,’ he admits, ‘especially when something affects me emotionally, either for reasons of colour, composition, letter style – sometimes it’s even something as simple as the ascender and descender width relative to each other. I’m sure that if I’d taken a class about this stuff I’d know much better why it all works the way it does, and I wouldn’t have to fumble around in the dark so much.’ Yet fumble, fiddle or fidget, Ware has raised his lettering beyond mere pastiche into the realm of reincarnation. Ware is a veritable born-again ‘show-card’ letterer who, back before computers and photostats, effortlessly rendered one-of-a-kind lettering for signs, windows and displays. Ware lacked formal lettering training, so for many years he’d teach himself by copying examples from old Speedball manuals, the bibles of commercial show-card writing from the 1920s to the 1950s. Yet the desired effect was elusive. ‘I always gave up in disgust, sensing that somehow there was something missing in the instructions,’ he says. ‘I just couldn’t get the hang of it from those stupid pen-stroke diagrams.’ So Ware devoted increasingly more attention to display lettering, trying to learn how to use a ruler and a ruling pen. By his own account he struggled on hopelessly, until one day, shortly after moving to Chicago, he found a box of original advertising lettering artwork for a small novelty concern, the Val-Mor Company, in an old store named Uncle Fun. To this day Ware equivocates that his cartooning is not drawing per se: ‘it’s more like typography, a mechanical sort of “picture lettering”, which is why I guess some people hate it and say that my stuff is unemotional. I think it’s probably the same sort of approach that Dan Clowes and Charles Burns have taken – their stuff was a real inspiration, obviously, along with Ernie Bushmiller – though I doubt they were anywhere near as ridiculously self-conscious about it.’ Self-conscious or not, describing his drawings as typography underscores the essence of his unique comic characters. While they do not necessarily have the overt emotionality of a Clowes (Ghost World) or the satirically goofy personae of a Crumb, they are imbued with graphic power that make them mnemonic. His characters Jimmy and Rusty, for example, are akin to early twentieth-century trade characters, logos that adhere to the memory and evoke emotion and recognition. The characters are typographic not simply because they are geometrically rooted but because they are vessels for meaning – but hey, that’s enough ethereal analysis for now. Technically speaking, Ware’s work relies on a great facility for achieving perfection. Splash panels from Quimby the Mouse.